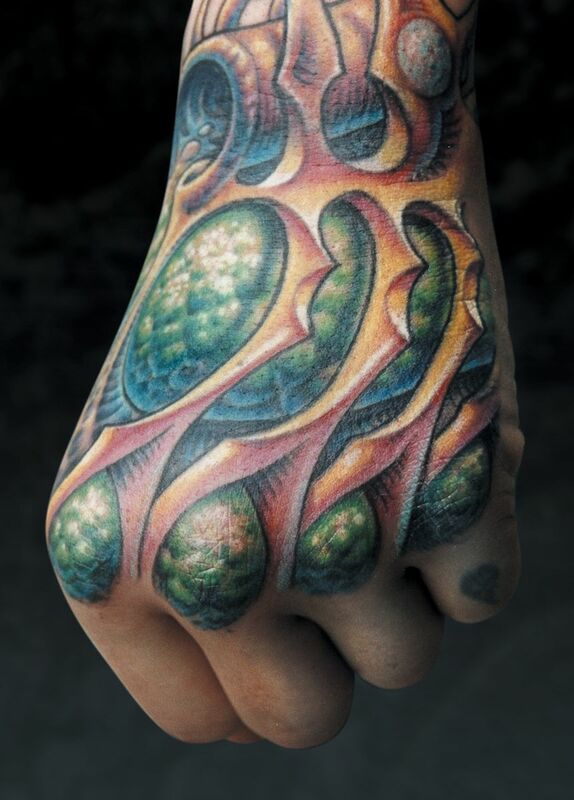 The tattoo in Fig. 46a is another example of smooth versus bumpy. In this case there are several holes in the smooth foreground skull that reveal areas of bumpy patterning through them. This bumpy texture was given an overall radiating flow that continues from one hole to the next, giving the background a sense of continuity. 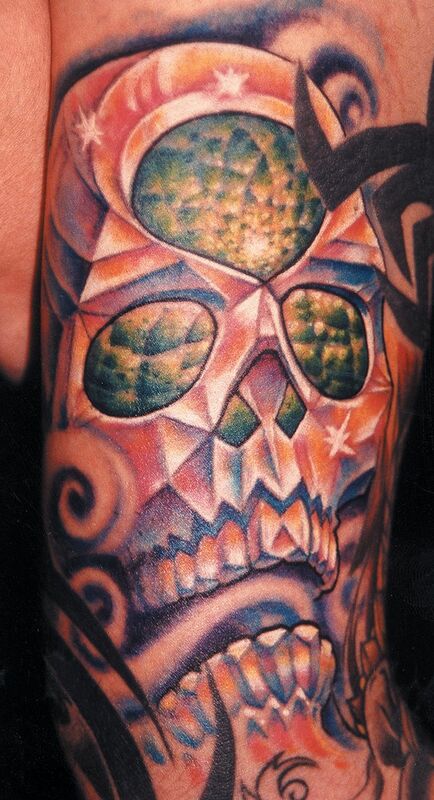 We used green in the background texture and orange in the skull to separate their color schemes from each other. The small details in the background versus the smooth simplicity of the crystal facets, in addition to making these two elements visually different, gives an interesting impression of something very large inside something very small. In Fig. 46b we have several different textures. 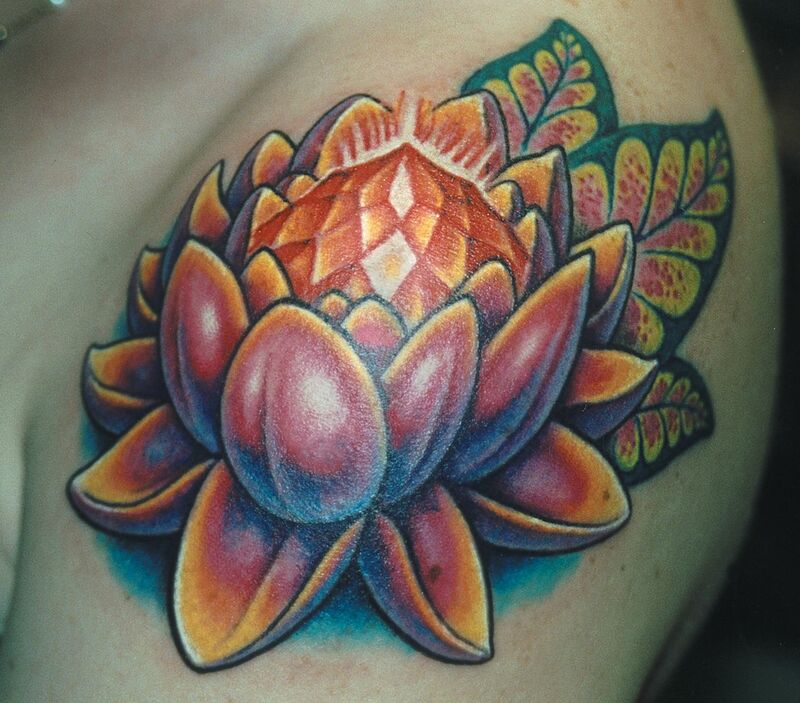 The petals of the lotus are smooth and soft, with warms on their upper areas and cools underneath to give them form and volume. The gemstone in the center is sharp and faceted, made all of straight lines and angular corners; these features contrast the smooth gradations and flowing arcs of the petals. A glow around the tip of the gemstone brings the point forward, while the directional movement of the rays brings more attention to it. The leaves in the background are made of long simple arcs that flow nicely with the shoulder. The pattern inside them is made of repeated arches filled with small and random textures, complementing the simplicity of the outline of the leaves and contrasting the textures of the flower petals and the gemstone. In Fig. 46c is a piece with two distinctly contrasting textures, smooth and rough. I tried to give these different elements 50-50 priority, letting them share the hand equally. The smooth stuff is given clean, sharp black outlines and long, clear highlights which stand out resolutely in front of the chaotic texture in the green stuff. Both textures use the warm above/cool below logic, but the blue-green cools on the textured shapes are much cooler than the lavender cools on the undersides of the smooth stuff, keeping the shapes distinct from each other. The smooth struts cast shadows as they pass over the bumpy background, spelling out for the viewer exactly what simulated distance there is between them. The knuckles are rendered in such a way that the parts that will naturally heal light are intended to be light in the first place.